Make sure that you replace any rotted boards and securely nail down any loose boards or wood trim before you start your siding project. Also scrape away any old caulking around your windows and doors to make sure your new siding will sit correctly against your walls. 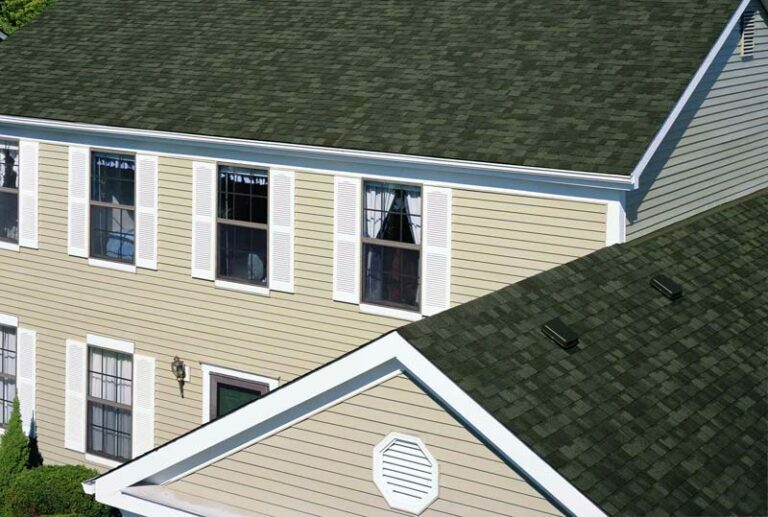 In addition, remove any downspouts, moldings, and lighting fixtures that may get in the way of your new siding. Before you begin installing your siding on the sides of your home, you’ll need to make sure the inner and outer corners are taken care of. Measure your corner post so that there will be a ½-inch gap between the top of the post and the eave of the house. Make a straight cut on your corner post using snips and cutting through the flanges. To install the post, place against the house and nail it in starting at the top. Place a nail at the top of the upper slot on each side. Then, check to make sure it fits well and is straight. Continue to nail it in place in the middle of the slots every eight to 12 inches. After you’ve installed your corner post, you’ll want to install your siding trim around your windows and doors. Measure the width of your window or door. Then measure the width of your J-channel (many times, it’ll be about an inch). Cut two pieces of channel the width of your window/door plus the width of your channel (for instance, if you window is 36″ wide and your channel is an inch wide, cut the piece to be 37″). Do this for your vertical pieces as well. Then, cut a tab in each piece along the extra inch of channel. This will let you bend it around the window and fit it into the next piece. Choose one side of the window/door to start and make sure your J-channel piece sits tightly and flush against it. Then, nail it in every third slot. Fit your next piece into the secured piece and repeat until all four pieces (or three if you’re doing a door) are secure. Next, it’s time to start the side installation. Note the lowest part of your wall that will be sided and use your chalk reel to make a chalk line across the house. Place your starter strip along the line and check to make sure it’s level. When it is, nail in your starter strip every ten inches. Then, measure your first piece of siding to your desired length and place over your starter strip. Make sure to leave ¼” between the end of the siding and the end of your wall to allow for expansion and contraction of the vinyl when temperatures fluctuate. Nail in your first piece of siding every eight to 12 inches, leaving about 1/8″ between each nail and the wall. Continue until you side your entire wall. When you get to your windows, a full piece of siding may not fit. You may need to cut it down. Measure to see how much room is between the last piece of siding you installed and the bottom of your window (make sure the measurement is up into the J-channel and then subtract ¼”). Cut your next piece of siding to fit into that measurement. You can do this by measuring from the top of the piece down, then drawing a straight line across on the underside. Use a utility knife to score along the line, then bend the siding so that it snaps cleanly. After you have the right sized piece, you can install it the same as the rest. Make sure that the top sits snugly into the J-channel.